This photograph was taken from the Space Shuttle. 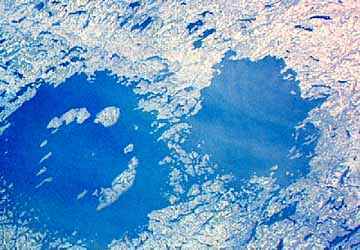 It shows an area about 28 by 40 miles in size located in northern Quebec in Canada. You can see lots and lots of lakes. Can you see any craters? Image courtesy of NASA/Johnson Space Center. Space Shuttle photograph STS61A-35-86. When you think you have found a crater, click on the image and find out if you were right!